We have led an interview with the initiator Dr. Karim Chabrak, who launched the COINSENCE project in early 2018. COINSENCE is an open collaboration platform where people and organizations can network and collaborate on ideas and projects. In order to stimulate activities and create synergies, we want to enable groups and organizations to create and distribute their own digital currencies and project participations dynamically, transparently and in a consensus-based way. Community-specific currencies, which are based on benefit commitments, are democratically created and invested in projects through community members. COINSENCE uses the open-source platform HumHub as a technical basis. It is extended with a self-developed currency functionality. 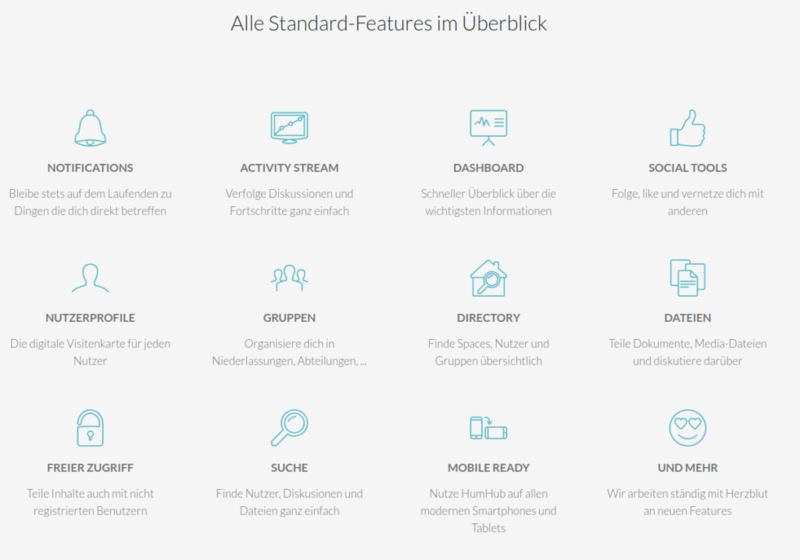 HumHub is user-friendly, open source and modular flexibly applicable. In addition, there are personal contacts with the HumHub developers, who are also enthusiastic about the idea. First of all, to connect people in an autonomous area. In the discourse of data security, Facebook is often referred to as a “data kraken”. There, all data is centralized, the users are considered as goods. Our aim is to be able to offer a democratically controlled, transparent communication platform as an alternative. But we do not want to stop here. In particular, we want to enable a new way of doing business. People should be rewarded for their commitment, including volunteer work. They should also be able to live on it, so we need a currency. The established currencies (Euro, Dollar, etc.) are capitalistic or profit-oriented and are not able to provide such a thing. Often, the very jobs that our society urgently needs (health, child care, nursing, etc.) are poorly paid. But such a thing can be done by a decentralized monetary system, in which money creation is not reserved for a few, but happens through communities and their added value. 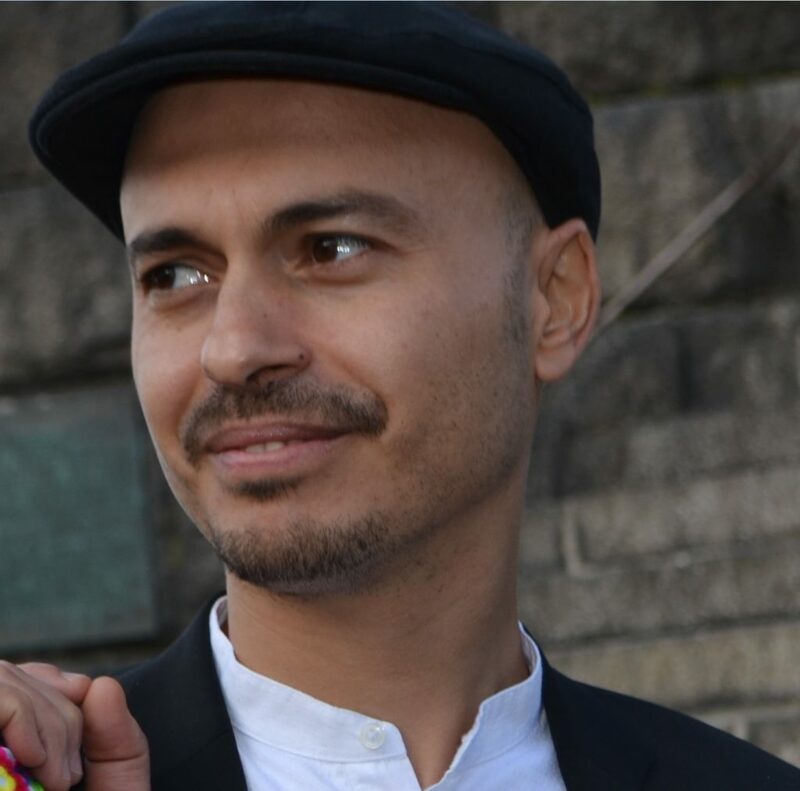 Democratically, the communities can decide what this value creation should look like in order to serve the community and ultimately the common good. In order for the whole thing to have economic relevance, we offer instruments that promote participation, flexibility, effectiveness and efficiency. So far, investments, research and development often happen behind the closed doors of established companies. With COINSENCE, it becomes possible to democratize these processes and make them available to all. Through such participation models, we can create prosumer ecosystems in the long term. These are places where resources and markets can be shaped by the people who depend on them. The prototype was released in early 2018 and is currently being tested by 50 users (as of January 2018), including representatives of the Fair.Coop community. HumHub itself is already an established software system, i.e. a finished product. The prototype will initially be a central platform. But in the future, we want to democratize this by implementing the service in a blockchain-based way. Generally for all “makers” with meaningful project ideas, who want to work with several people. These can be individuals or entire initiatives. For instance, associations – here a lot of volunteer work happens, which is not yet remunerated with money. 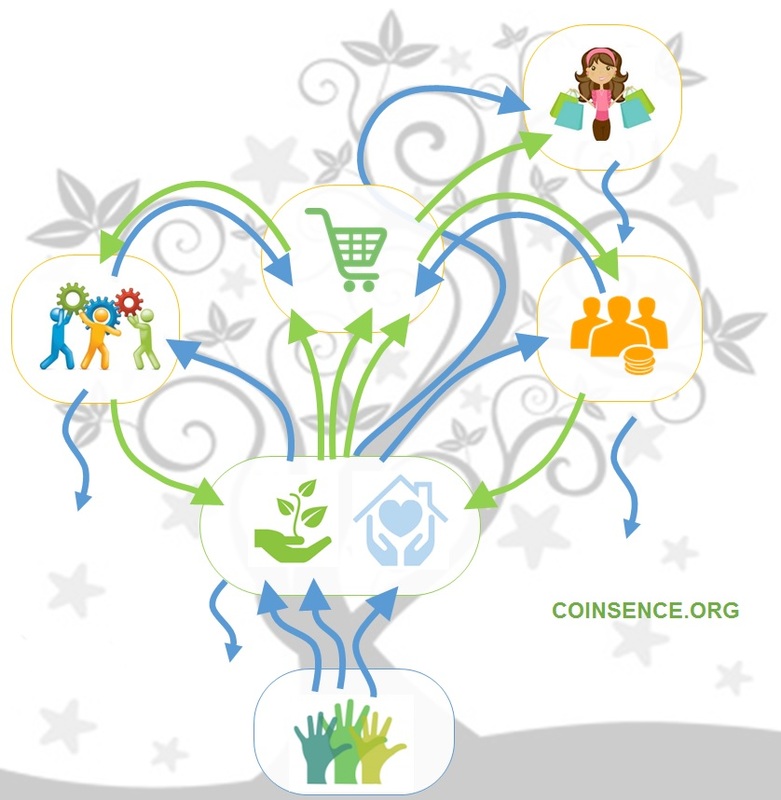 With COINSENCE, an association can pay its volunteers in their own currency. Such a community currency is not a classic means of payment, but rather a pure tool that depicts the exchange of non-monetary resources – i.e. goods and services. We want to address people and groups who are socially and ecologically involved. We also intend to establish contacts with multipliers, for example cooperative banks, NGOs and civil cooperatives. So far, we have held back a bit, because we were waiting for the completion of the prototype. The concept is something new – and that is much easier to explain if you can try out the platform immediately. Further information is available on the COINSENCE website. The prototype has just been released, currently about 50 people are registered. But there is a larger personal network of people who are keen to test the platform. No. COINSENCE should be open and free for all topics. The idealistic focus is on democratic economies, projects oriented towards the common good and human potential development. These functions are coupled with currency functionalities or individual money creation. The administrator of a community can create a currency there, and each user has an account in a corresponding currency. Similar to the checking account, users can transfer COINs from one account to the other. 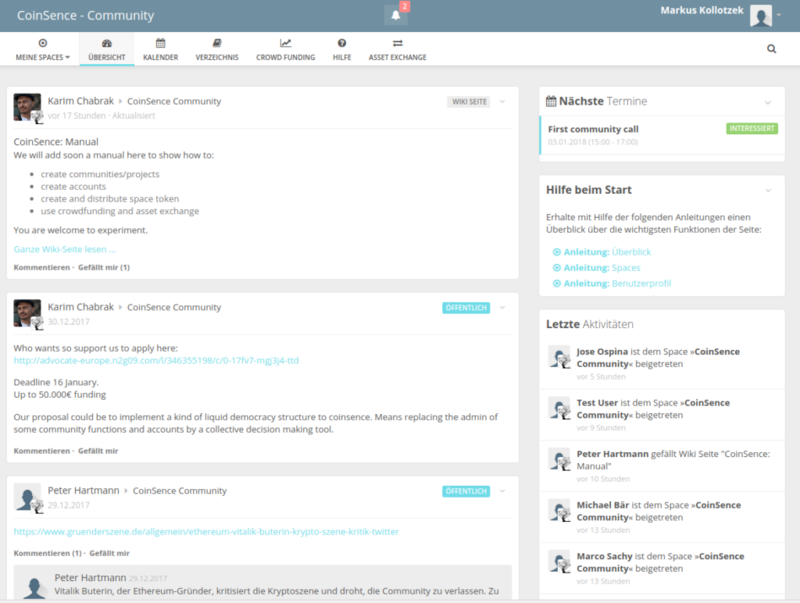 There is a rudimentary marketplace function to promote discussions on the community‘s needs. Within the community, there is thus an added value in the corresponding community currency. In order for users to be able to use their currency even outside their community, a currency swap meet is planned. There you can exchange one digital currency for another, possibly even in euros. Currency consortia are also conceivable, e.g. to form funds consisting of several currencies. The coupling of a user-friendly social network with a currency functionality. I do not know any open-source and user-friendly platform that combines a social network with currency functionalities and other collaboration features. 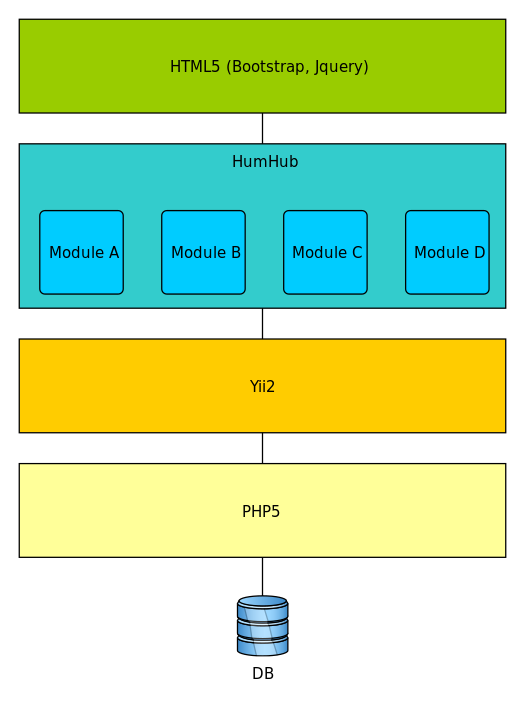 HumHub is programmed in PHP based on the yii framework. The currency functionality is a simple extension that resides centrally in an SQL database. It cannot be a definitive solution to use only HumHub in the long run, because we want to reach millions of users. For this purpose, HumHub would have to be extended, and further platform solutions and features would have to come to that. In addition, we want a decentralized, blockchain-based architecture. For us, HumHub is the starting solution with an aesthetic interface and basic functionalities that help us plan and implement the next steps together. By the way, the specific extensions for COINSENCE are also programmed by the HumHub developers. Yes. The source code will be published after the launch of the prototype and the end of the test phase. Since it is initially a prototype, we have not yet provided any interfaces. HumHub itself has some interfaces, for example, an LDAP server can be connected for authentication. Also login via Facebook, Twitter, etc. is possible. Open interfaces and interoperability are extremely important to me, so that the freedom of the users and the innovation of the developers are not restricted. We have to distinguish between several levels here. The prototype is a unique development whose funding is secured. The community will decide what the decentralized version of COINSENCE should look like in the future. And also about the remuneration of development services. It would be natural to do this via COINSENCE as well – that is, to pay developers in a digital community currency. However, as we still have to cover other costs in euros, there is the idea of ​​offering services, e.g. IT system integration or consulting for companies. But that would be an action independent of the network to secure basic funding. I have had the idea for four years. In the initial phase, I did a lot of research and conceptual work. Many contacts were also made then. I published the concept in the spring of 2016 in the form of a website. In the summer of 2017, I decided to develop a prototype. In recent months, I have had numerous discussions with potential partners. Since early 2018, the prototype has been online. I would say that everyone is behind the platform who joins and participates in our community. After all, a community lives from the contribution of the people involved. In addition, various developers and supporters are directly involved. There is currently no legal form. In what preliminary legal form the prototype will be published is just being clarified. It is important that the platform is hosted by a legal form that guarantees users’ participation rights. This question will hopefully become superfluous if we manage to build a decentralized peer-to-peer network in which no central influence is possible, where autonomous spaces can emerge and rule changes and technical enhancements can only happen in a consensus-based way. Yes, above all, we need users who test the prototype and then join in the discussion on the next steps. I am also interested in partners for further development. We can also accept purpose-based donations through our partner associations. I am open to any cooperation with partners. It is important to me that they represent appropriate values ​​- e.g. the promotion of open and collaborative value creation and sustainability. I have established the first contacts to similarly oriented projects. We recently released the prototype at https://community.coinsence.org. 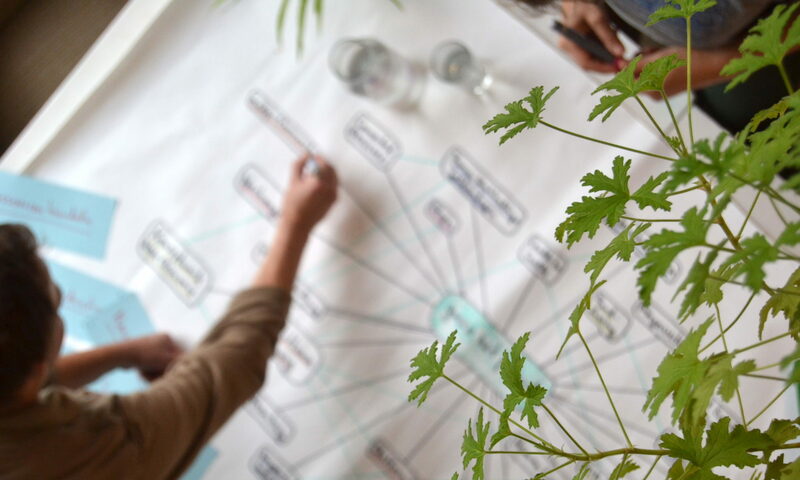 Now we want to build a changemaker community, get feedback, and plan the next steps together. Afterwards, I think a meeting with other potential partners will make sense. At the makers4humanity lab 2018, we would be pleased to have a presentation from COINSENCE. Unfortunately, I cannot attend, but we will certainly find a good representative. I am pleased that there are now platforms that allow an alternative way of value creation. We just have to make sure that they are not in the hands of a few privileged people. I would compare a platform to a country. Many people live and work there and this “country” should be governed democratically – everything else would be a dictatorship. I would like to see democratic governance for all digital platforms, because most of them are commercial and anything but democratic. If you look a little bit into the future, topics such as “machine learning” and “artificial intelligence” will gain weight there as well. We must be careful that these powerful technologies are not determined by a few players. Blockchain technology is a promising tool for making processes more democratic and decentralized.